At 35 hours, the French have the shortest legal working week in Europe. With it, they have a reputation in some quarters for an easy working life, staunchly defended by powerful labour unions. 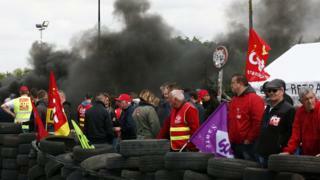 This week, there is widespread disruption across the country after France's largest union called a strike over planned reforms to the labour laws. Workers have blockaded power plants, petrol stations, and oil refineries. So why do the French go on strike more than any of their European partners? Is life for the workforce really so good? The 35-hour limit was introduced in 2000 and has come to be seen as sacrosanct by many on the French left. It is the lowest in Europe, shorter than the 40-hour limit in many countries including Spain, and far fewer than the 48-hour limit in the UK. France also mandates 11 consecutive hours of rest between each working day and one consecutive 35-hour period of rest per week, usually a weekend. So far, so good for the workers. But the average number of hours worked is higher than the statutory limit - 37.5 hours a week in 2014, more than the average 36.1 hours clocked up by the British and the 35.3 by the Germans. By the letter of the law, the French should be paid overtime rates or compensated in time off for every hour they work over 35, unlike the Brits and the Germans. And the French have a generous holiday allotment - an average 30 days a year of paid leave, compared with 28 in the UK, 25 in Norway and Denmark, and 20 in Germany. France's annual average wage in 2014 - $47,885 - compared favourably with Germany's - $48,479 - but was less than the UK's at $54,350. The controversial labour reforms that sparked the strikes would maintain the all-important 35-hour week, but they would allow companies to ask staff to work up to 46 hours a week, or 60 in exceptional circumstances. The worker would be compensated by working some shorter weeks so they averaged 35 hours a week over every three-month period. For some workers, the 11-hour break between shifts could be broken up under the new laws. The reforms would also make it easier for employers to make workers redundant, which the government hopes will encourage companies to take risks on hiring new staff. France's existing labour laws offer substantial protections to workers. Employers can be barred from making redundancies if the company or parent company is profitable. The reforms would allow companies whose revenues have fallen for four consecutive quarters to lay people off. Those laws are still substantially more friendly to workers than in other European countries. In the UK, profitable companies can make redundancies with relatively few conditions attached, as they can in Germany. Spain enforces a similar profitability condition but the employer only has to post losses for three quarters. So if employment conditions are good why is unemployment in France at 10.5%, compared with 5.4% in the UK and 4.8% in Germany? One reason the French are so often on strike comes down to the issue of "insiders versus outsiders", says Professor Iain Begg, a researcher from the London School of Economics (LSE). "Those in jobs who already have various forms of labour protection are keen to preserve them, obviously," he says. "But, to use a Richard Nixon term, there's a silent majority outside which would probably quite welcome a relaxation of the firm labour laws because they would have a better chance of getting a job." France has a "longstanding view that the worker must be protected," says Prof Begg, "but if you were the unemployed youth of North African origin in one of the Paris banlieues, you might think it's totally alien to what you expect. "You don't get a job under any circumstances, so the idea that the jobs there are are so heavily protected is hardly appealing." Alisdair Gould, who is from the UK but has been living and working as a teacher in Paris for 12 years, and is on strike, says that conditions for workers in France are "generally good ... preferable to the UK" but will be "diluted" by the government's reforms. "I'm particularly concerned about the part regarding the 'hiring and firing' of people," he says. "It could mean that older people will be got rid of, even though they are experienced. Mr Gould said opinion was "mixed" and acknowledged that there was "a lot of agreement with the reforms." "I know that people are frustrated with the strikes, for example they are having problems getting fuel, but I am giving up a day's pay on a regular basis to protect people's employment rights." Workers' unions have pointed out that France's productivity is among the highest in Europe, and it is. It is significantly higher than the UK's and marginally higher than even Germany's. But the statistics are something of a red herring, says Prof Begg. Because France's employment rate is significantly lower than the UK's and Germany's, fewer working age people are employed. And it tends to be the less productive workers, for a variety of reasons, that are unemployed or underemployed, meaning that France has a greater proportion of more highly-productive workers. Which skews the figures. So France does, on paper at least, have some of the most worker-friendly labour laws in Europe, and some of the most powerful labour unions. But its unemployment rate is nearly twice that of the UK and more than double that of Germany. "The hard fact is that Germany has a low unemployment rate and France has gone in the opposite direction," says Prof Begg. "Is solidarity now being used as an argument for not effecting change which has to come at some point?"